Learn how you can boondock longer by installing a simple after-market system that costs less than $300. 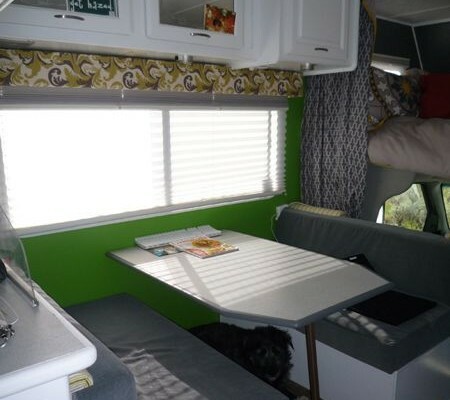 A neat DIY RV mod. 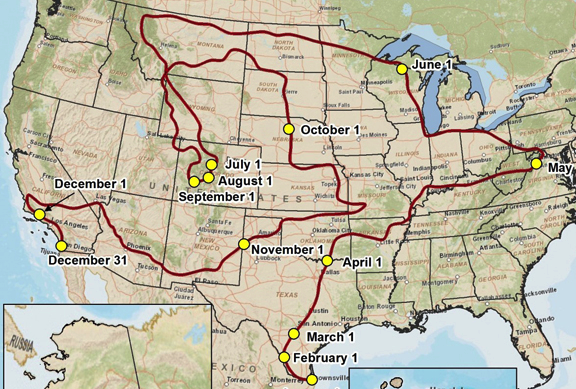 If you love taking your RV into the back country, you know what a hassle it is to leave an awesome boondocking spot because your holding tanks are full. Finding a dump station is the last thing any of us want to do when we’re out having a good time. If you know how to use a drill, now you can keep the adventure going by installing this easy DIY gray water recycling system from USI-RV in your rig. Until now, the best gray water recycling method involved using a 5-gallon bucket to capture running water while you waited for the shower water to heat up. 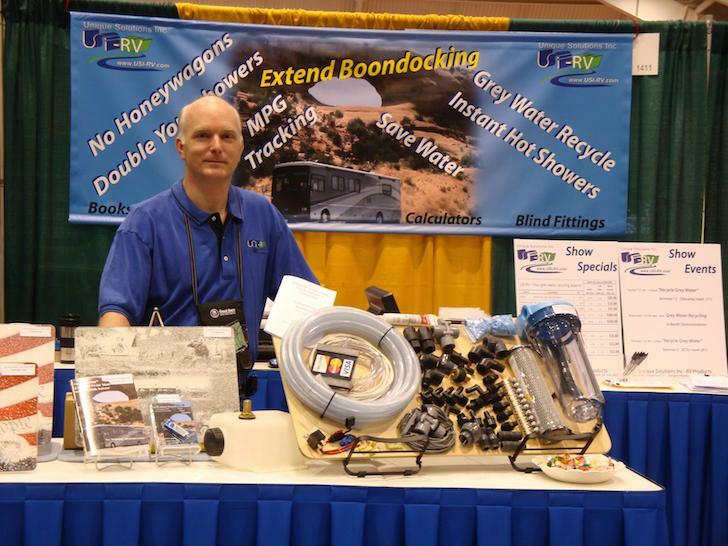 One RVer named Greg Corwin thought campers could do better, so he engineered the Extend Your Stay Tank Saver Kit, a simple but innovative gray water recycling system that lets you stay in the back country for much longer than normal. 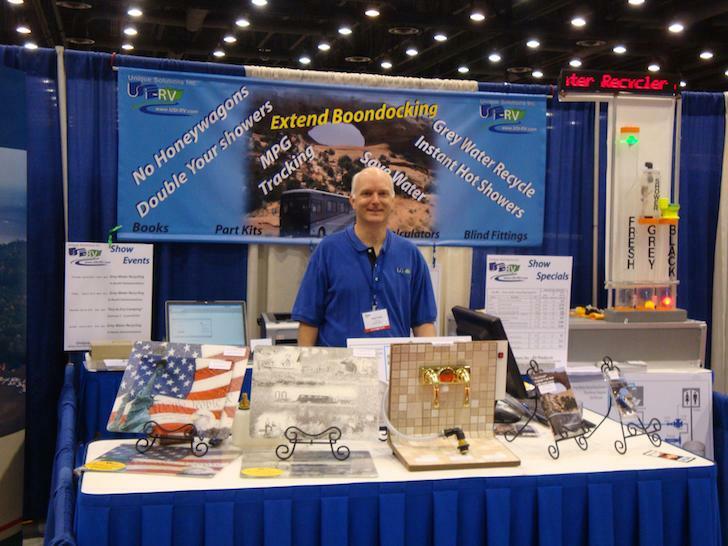 Greg Corwin is the founder of Chicago-based USI RV, a company that wants RVers to get the most enjoyment out of their rigs. From a convenience perspective I always enjoyed going to places where I didn’t have hookups. One of the things that was most frustrating was having to be too conservative in taking my shower every morning. I had to come up with a way to solve that. Corwin’s inspirational moment occurred a few years ago while watching a television show about sustainable living and gray water recycling. 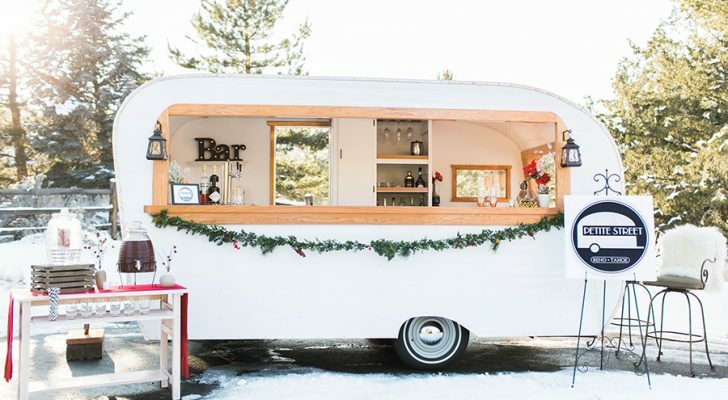 While learning how sustainable stick homes reuse bath water for toilet flushing, he knew it wouldn’t be too difficult to take this common gray water recycling method and adapt it to RVs. As a technical engineer by trade, the idea led to Corwin’s Extend Your Stay Tank Saver Kit, a DIY package that utilizes a secondary water pump to redirect used kitchen and bath water into the toilet for flushing purposes. 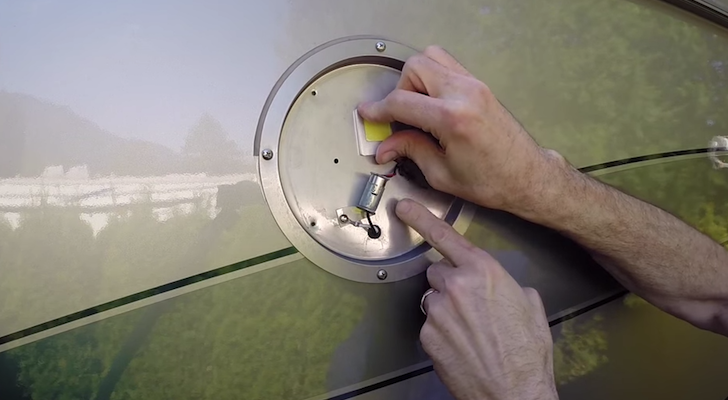 The system enables RVers to stay put longer by reducing the level of water in the gray tanks, which makes more room for additional showers and kitchen duties. “The byproduct is you’re not using fresh water when you flush your toilet, so you’re also saving fresh water,” Corwin explains. For those times when you’re living large with campground hookups, you can take the system out of recycling mode with the flip of switch placed near the toilet. 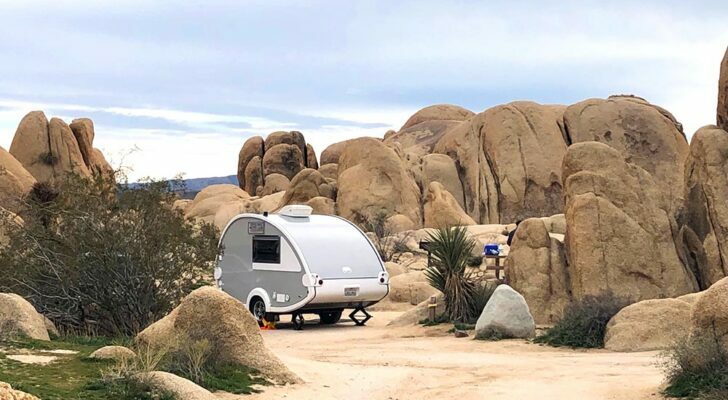 RVs with black and gray tanks that are almost identical in size will benefit most from USI RV’s gray water recycling system, since it allows campers to make full use of the black tank’s capacity. 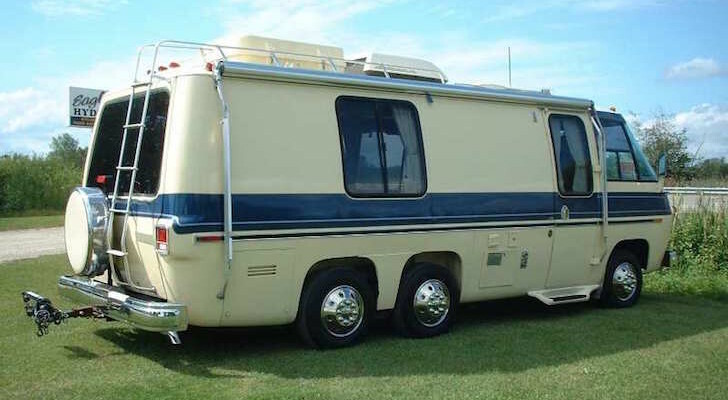 But even if you have mismatched gray and black tanks, or drive a smaller RV like a Class B, you’ll still benefit from using the tank saver kit. 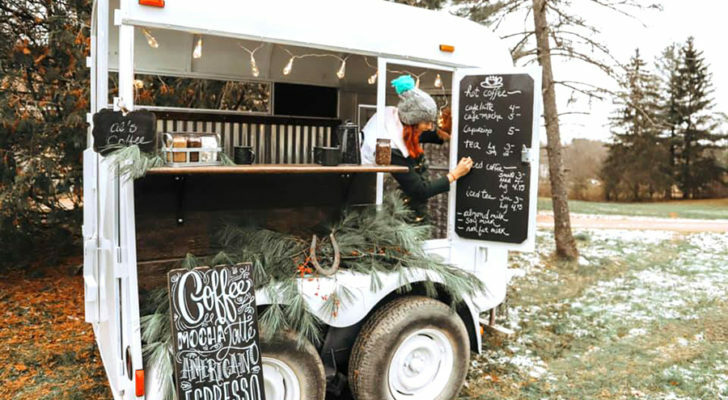 For example, a van dweller with tanks that can only hold one day’s worth of water can now enjoy two full days – an entire weekend – without having to empty the waste tanks. Gray water is normally smelly by nature. But this recycling system uses a hard-working carbon-wrapped filter that removes particulates and odors (without restricting water flow). Gray water bacteria build up can be prevented by wiping down dirty plates and cookware with paper towels before you wash them. Using a tank deodorizer also helps. 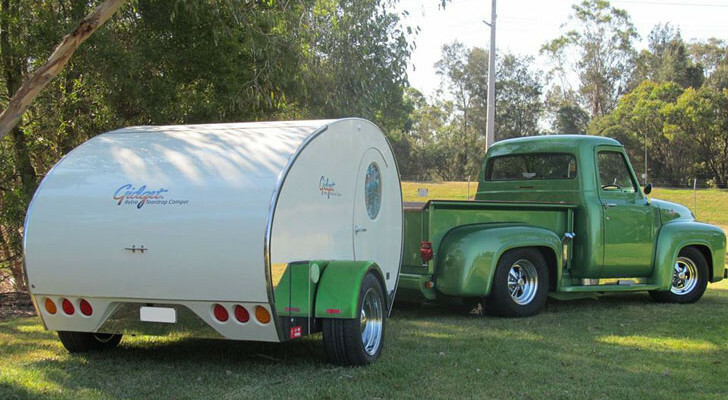 If you’re not sure about how much this system will benefit your camping experience, consider downloading Corwin’s Gray Water Recycling Calculator. The calculator determines how much longer you can dry camp based on factors like the number of campers in your rig, how often you flush your toilet, wash dishes and more. Later if you choose to install the recycling system, you can use the calculator to help you gauge how long you’ll be able to stay in the backwoods if normal factors change, such as taking on extra campers in your RV. You don’t have to be a mechanical whiz to install the Extend Your Stay Tank Saver Kit, but you need to know how to use a drill. The $275 kit includes about 60 hard-to-find parts that will help you build your own RV gray water recycling system. 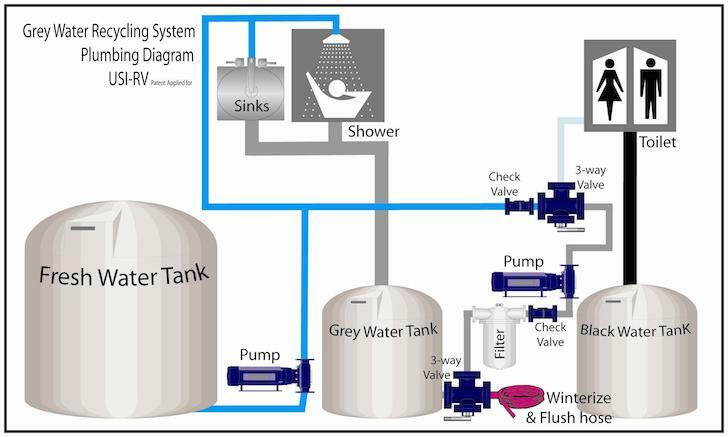 The secondary water pump that moves your gray water into your toilet isn’t included, but if you buy the kit, Corwin suggests taking your existing RV water pump and using it for this modification. You can then upgrade to a better water pump with higher, continuous flow, for normal use. Installation should take about four hours if you follow the instruction book’s step-by-step directions. But if drilling into your gray water tank and making some electrical connections makes you nervous, Corwin can offer email and phone tech support to get you through the hardest parts. 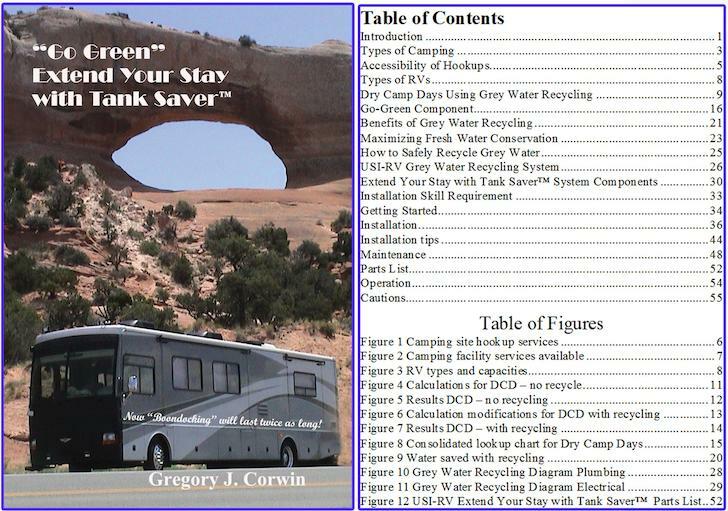 For those geeked-out DIY RVers with a shop full of tools and parts, the “Go Green, Extend Your Stay Tank Saver” book offered on the USI RV website is a low-cost illustrated manual for installing your own system, using all of your own parts and tools. Are you ready to toss your 5-gallon bucket? Whether you’re a full-time RVer or a part-time weekend camper, the Extend Your Stay Tank Saver Kit is one way to make your off-grid journeys better than ever. If you enjoyed reading about this DIY gray water recycling kit, you’ll love the DoItYourselfRV newsletter. Get free updates, unpublished content, and special offers. Sign up now.